VNOG Blog: AWN: Pete Sohn talks about "Partly Cloudy"
AWN: Pete Sohn talks about "Partly Cloudy"
Here's an interview on Animation World Network with Pete Sohn, Director of Pixar's latest short film, "Partly Cloudy". This short will be in front of "Up" next month. I had the pleasure to seeing both at the Up wrap party this past weekend, and I can tell you, you're in for two treats! Both films are charming and beautiful. 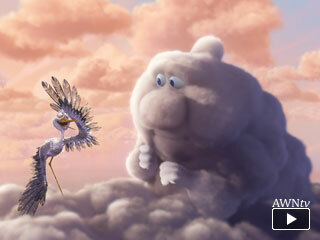 Up will probably make you cry at least twice, so bring Kleenex. You've been warned. Wow, now I am looking forward to not only the movie Up but the short. Awesome to see Peter Sohn as a director, after seeing him in so many featurettes and pictures from my scrounging of Pixar factoids. Both films look gorgeous, I absolutely love looking at clips of both of these, and I have absolute confidence that it will be another great one! Wish you guys would have a pre-screening for the movie out here in Indiana, but I'm a little doubtful that would happen. Thanks for posting the Peter Sohn interview: I would have probably missed it in the finals crunch of this semester. It's very inspiring to read and absorb! (That and I got to see my first tantalizing glimpse of Partly Cloudy). Good luck with your work in Toy Story 3, also!